Successfully Added Vernee Mix 2 Android Phone - 6-Inch Bezel-Less 2K Display, Android 7.1, Octa-Core, 4GB RAM, 4G (Blue) to your Shopping Cart. 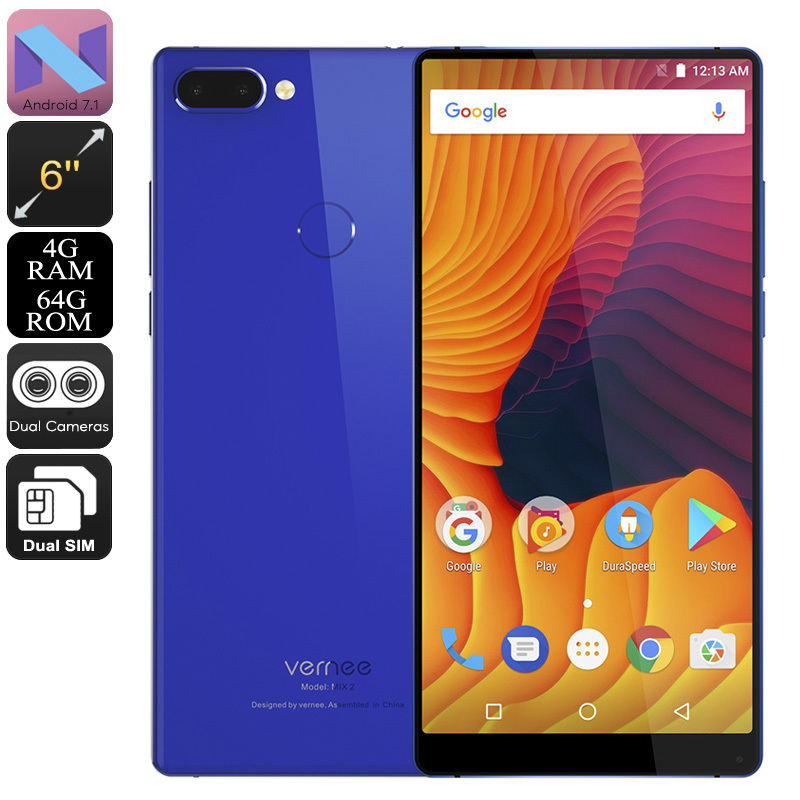 The Vernee Mix 2 is an affordable Android phone that lets you enjoy an outstanding user experience without needing to spend a large sum of cash. This latest Android phone comes with a breathtaking 6-Inch bezel-less display that treats you to absolutely stunning 2K resolutions. Thanks to this, you’ll be able to enjoy your favorite games, movies, and series like never before. With its edge-to-edge design, this display will truly treat you to an unlimited cinematic experience from the palm of your hand. The phone itself comes with 64GB ROM and a 128GB SD card slot so you won’t have to worry about storage for all your media files. With the Vernee Mix 2 at your side, you’ll never experience a moment of boredom again. This latest Android phone runs on Android 7.1 for a smooth and lag-free user experience. It furthermore packs some powerful hardware that lets you tackle the most demanding software features without dropping a frame. A powerful Octa-Core processor that has been clocked at 2.5GHz is in place together with 4GB of RAM. No matter what you’ll throw at this Android phone, there is nothing that will slow it down. In order to power all this hardware, your phone comes with a whopping 4200mAh battery. This cell delivers an unbelievable 20 hours of continuous usage time and 9 days standby time. With its Dual-IMEI numbers, the Vernee Mix 2 Android phone is great for separating work and private life. This cell phone lets you stay connected to two network providers at once, ensuring that you’ll always stay within reach to colleagues and loved ones. Additionally, you’ll also be treated to 4G which means that you can enjoy the fastest mobile data speeds no matter where you’re at. To further increase your overall user experience, the phone comes with a 13MP Dual-Rear camera and 8MP front snapper. With these cameras at your side, not a single special moment in life will ever pass by uncaptured again. The phone looks and feels great, after almost two years of having it, It serves its purpose. The screen quality is beautiful!